Whether your dream vacation consists of laying on the beach, shopping, water sports, golfing, taking in the sights or a mix of them all, Bermuda has you covered. The small island with a population of ~ 65,000 is only 22+ miles long (shorter than the distance of a marathon!) but is rich in culture, tradition and hidden gems to explore. Surprisingly, the destination is much closer than you’d expect, about a 90 minute flight from NYC and Boston. I’ve been lucky to visit the over the past few months and wanted to create a guide of all the places I’ve loved and was able to visit while being here. (With the help of input from locals, expats and chatting with business owners and my own exploring along the way.) There is much more to Bermuda than this guide, but I hope it’s the start of a pretty amazing visit to an incredible place. Bonus: scroll all the way down to download the Google map that includes all listed locations and more! Weather: Peak season in Bermuda is the summer. From May - October, with the average temperature hovering around 80-85 F. Looking for an off-season getaway? The wind and rain picks up around mid-November through March, but even then, temps average around 70F and don’t fall much below 60F and there are plenty of hot, sunny days. Currency: The exchange rate of Bermudian dollars to American dollars is 1:1. So you can use and interchange may get change in both US and Bermudian bills. Everywhere on the island accepts US dollars. What to bring: At the least, bring a rain jacket! Whether or not it actually rains, you’ll want one, especially if you rent or ride on a scooter. Plan to rent a scooter: Unless you really don’t want to, but depending on how long you’re staying, it’s the easiest way to get around! Oleander Cycles is the most popular! Prices of flights to Bermuda are pretty stable year-round. If you give yourself 3-4 weeks ahead of time to book your trip, you’re probably seeing a fair price. An average round trip from NYC - Bermuda is $313 - $345. LA - Bermuda $490 - $554. Boston - Bermuda $337 - $418. Miami - $407 - $550. There are only a few flights landing and taking off from Bermuda each day, so take that into consideration if you need a connecting flight to or from the island. When you arrive to the airport, there are taxis lined up outside ready to take you to your destination. FYI: you’ll need cash for your taxi! Or you can use the Bermuda-version of Uber, called Hitch. The app can be a bit glitchy but worth having downloaded as a way to pay cash-free. The iconic ‘pink palace’’ is more commonly called The Hamilton Princess. The luxury urban resort hosts 400 newly renovated rooms, 3 restaurants including acclaimed chef and restaurateur Marcus Samuelsson’s Marcus, it’s own Exhale Spa, meeting spaces and marina views, all 5 minutes from the heart of Hamilton. The hotel is also known for housing the Princess Art Collection including a curated mix top names in Pop and Modern art that can be found throughout the hotel. Guided tours are available. Whether you choose to stay here or just visit for a drink or meal, you’ll find an eclectic mix of patrons, travelers, locals and expats. If you want more beach than city, they have another location too, The Fairmont Southampton. 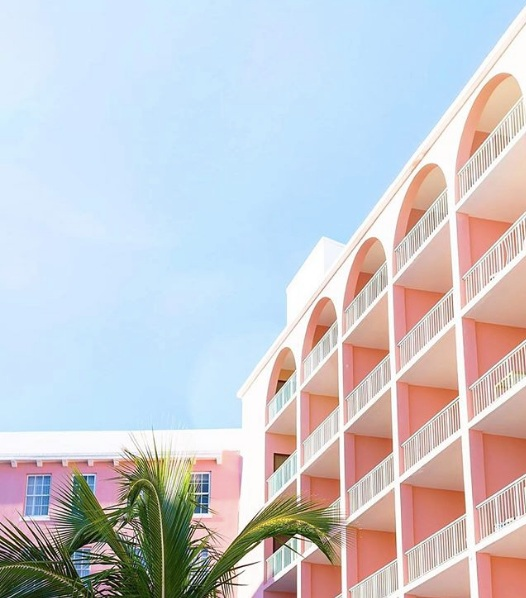 The newest resort addition to Bermuda in decades and with floor-to-ceiling panoramic oceanside views, it’s no wonder The Loren is said to have the best rooms on the island. The Loren’s Chef, Tim Sullivan, is committed to using only the highest quality ingredients with their seed-to-table and sea-to-table cuisine philosophy. The architecture of the hotel is calming and modern with natural wood and grey tones to compliment ocean views and natural light throughout the hotel. Enjoy a glass of wine or dinner on the porch and take in the views, or head to the pink sand beach for sunbathing and snorkeling. A newly renovated resort is a mix of ‘British comfort and seaside style’. With beautiful views of the ocean or Castle Harbor, the 92 guest rooms and suites outfitted in whites and creams make for a serene island escape. The Rosewood boasts Bermuda’s largest private pink sand beach, infinity pools, spa services, and sits on Tucker’s Point Golf, Beach and Tennis Club, ideal for vacationers and golfers, alike. Known for trademark pink sand beaches and cerulean water, the beaches are something you can’t miss. The South Shore is where you’ll find the pink sands, which are actually small pieces of shell and coral that’s washed ashore. Dipping your toes in won’t be a problem, the average water temperature from May - October is 80F. In the winter months, it drops to 60F but plenty of people will still be going for a dip! One of the more iconic beaches, Horseshoe Bay is located in the Southampton Parish, about 30 minutes from the city of Hamilton, either take a scooter, taxi or the #7 bus. A perfect spot to catch the sunrise, layout or swim during the day. For a more active option, you can walk or run the horse trails for almost the entirety of the south shore. Be sure to check out the rock formations and hidden coves throughout. This beach also has more facilities like changing rooms, beach and water activity rentals and nearby food, ice cream and rum swizzles in the summer months. One of the longer stretches of beach on the island, covers just over a half mile. On a calm day, you can snorkel just 60 meters out to see parrotfish and semi-submerged rock formations among the reefs. You can find private coves and end up at Horseshoe Bay from here by continuing west along the shore. While a portion of Elbow beach is privately owned by onsite hotels, a good portion of it is public access making it a popular spot for locals and vacationers, but one worth the visit! The water tends to be flat and calmer here, making it ideal for snorkeling, paddle boarding and swimming. About 100 yards off shore you can see the famous Pollockshields shipwreck. Water activity rentals are available from Elbow Beach Resort, but can be pricey. This is a private beach for guests of the Hamilton Princess. It’s located on the South Shore, just beyond Horseshoe Bay. The Princess offers free shuttles back and forth, hourly, or you can take a taxi or scooter. The beach is fully stocked with towels, changing areas, beach chairs, a playground, as well as free paddle boards and kayaks to take onto the water. If you walk past the cabanas and follow the path, you’ll find even better views of the ocean. Definitely a perk of staying at the Princess! One of the most popular beaches on the island and one of the best for snorkeling! In the summer months, you can eat lunch at the beach bar and restaurant, rent beach towels and gear for water sports, like snorkels, paddle boards and kayaks. At first glance, the beach is small and may not seem like much, but the water is shallow with lots of different pockets to explore. You’re likely to see blue parrotfish, groupers and a variety of colorful fish. On summer Friday’s there are bonfires and live music. A 12-acre natural attraction lush in greenery, subterranean caves, grottos and it’s own blue hole attracts tourists and locals alike. You’ll follow winding trails beneath a canopy of trees that showcases the natural diversity of the island. The Blue Hole, best recognized by it’s stunning aerial photos, is a deep and crystal clear mangrove pond that’s ideal for snorkeling, swimming, floating and rock climbing. After a float, you can also catch a tour of the world-famous Crystal Caves. 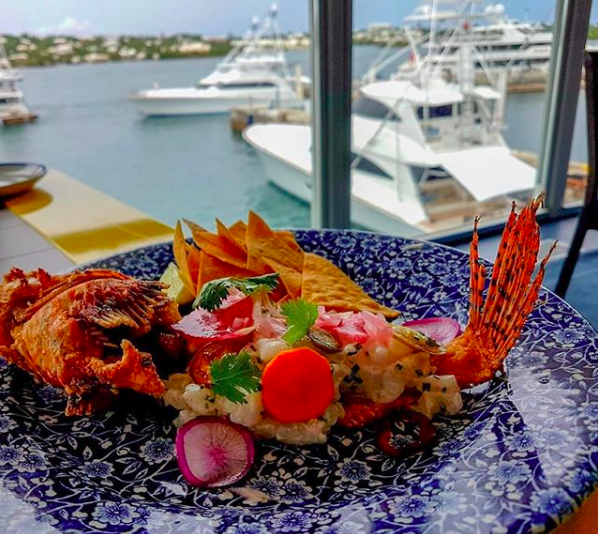 With a mix of local Bermudian cuisine, the influence of international chefs and a focus on fresh, local ingredients, dining in Bermuda has something for everyone. Owned by Marcus Samuelsson, celebrity chef and restaurateur best known for guest appearances on Top Chef and one of his many restaurants, Red Rooster in Harlem. Marcus’ restaurant is part of the Hamilton Princess and designed the menu to feature a fresh interpretation Bermudian cuisine. The dining area has both indoor and outdoor, screened patio seating and features an open kitchen layout. Menu favorites are the fried chicken and waffles appetizer, obama short ribs, catch of the day, and the jerk chicken. Staff is passionate and very accommodating, whether you have food allergies, are celebrating a special event, or just visiting, you will likely get a visit from the Head Chef and rest assured you’ll be taken care of. Whether you’re visiting for business, pleasure or a local, be sure to add Marcus’ to your list. For a more traditional fine dining option, make a reservation for Royal Palms at the Ascot. Tucked inside of a small boutique hotel just outside of Hamilton, Royal Palms offers an extensive menu inspired progressive mediterranean cuisine. Each dish is a work of art that will truly make it a culinary highlight of your visit. Named after Mark Twain who was a regular visitor to Bermuda, the Huckleberry is part of the Rosedon Hotel just across the street from the Hamilton Princess. The menu features seasonally-inspired dishes and proudly accommodates to gluten-free and vegetarian guests “with the same exceptional dining experience”. If you go for breakfast on a nice day, ask to sit on the porch! A French bistro and one of the only restaurants on the island that serves Sunday brunch (many restaurants and stores are closed or open late on Sundays). The atmosphere is sophisticated, casual and the menu offers traditional American-style, English and Bermudian breakfasts! A great spot for dining with a group as well. Overlooking the pink sand beaches of Elbow Beach, Lido offers an upscale, fine dining experience in a sophisticated atmosphere. The Mediterranean cuisine highlights local sea-to-table and farm-to-table ingredients. Offers accommodations for special occasions or events. Ask to sit outdoors and bring your sweet tooth for their unique dessert menu! Recently named Best of Bermuda for “Best Place to Party & Ambience”...how much more convincing could you need? Sea Breeze is located next to Lido in the Elbow Beach Resort and offers its own, more casual experience and atmosphere. Outdoor communal tables make it a fun spot to socialize and unwind, especially when al fresco drinks and plates like tapas and sushi from the menu. The Swizzle is a casual eatery and fun environment offering classic pub dishes and drinks. It’s named after the island’s trademark rum swizzle (which is a must-order). It’s a nice lunch or casual dinner option, especially if you sit outdoors. The go-to spot for work meetings or a nice, but not-too-nice lunch is Devil’s Isle. The menu is a mix of refined classic and trendy dishes, with a wide selection of burgers, salads, entrees as well as a variety of gluten-free and vegetarian options. They also have a fully stocked bar with a cocktail, beer and wine selection. Their coffee is one of the 3 roasters on the island and they have their own coffee shop next door for grab-and-go service. A great spot to meet a friend for breakfast and coffee to start the day, or to grab a drink and end it. An all-day cafe, offering everything from breakfast bowls and smoothies to homemade pizza and signature cocktails! This spot is a must-try and on almost every travel and wellness guide to Bermuda. It’s open 8am-10pm daily and just a 10 minute drive from Hamilton in Flatt’s Village. It’s nearby the Bermuda Aquarium and on the way to St. George’s making it the perfect stop to fuel up before or after. It’s recommended you make a reservation, especially later in the day, as they’re often fully booked! Right next door to their full-service restaurant is Devil’s Isle coffee shop and smoothie bar. In addition to their island-roasted coffee menu, you can find made-to-order sandwiches, pick up a protein bar or fresh baked good, or order wellness drinks like turmeric lattes, matcha, smoothies and juices. There are a few tables outside if you want your coffee to stay. You can also purchase Devil’s Isle beans to brew at home. Coffee shop with a warm and artsy vibe, just one street over from Devil’s Isle. They also roast their coffee on island and offer freshly baked assorted pastries, including breads, muffins and a granola bar that sells out early almost every morning! Many order to-go here, but if you stay, sit in their living room-style backroom with assorted chairs and tables where you’ll see friends catching up and a few people working on laptops. (There is wifi but it’s iffy - good for sending a few emails, not great for working all day.) There’s also outdoor seating. The staff is always cheerful and friendly, making it a local coffee-lover’s favorite. Just remember, it’s cash only! Victoire Cafe - a minimalist cafe in St. George’s serving coffee, matcha and local baked goods. It’s also a popular stop for cyclists to stop mid-ride and refuel. Marcus - a perfect go-to place to grab drinks and catch up. Most nights have themed live music, like Reggae on Thursdays. Try the Princess Mule! Yours Truly - an intimate, candlelit bar that feels like a well kept secret. From the outside, the door only has a ‘YT’ and a doorbell, but don’t worry! You’re in the right place. Your craft cocktail will come with a hand shaved ice cube, too! Wine Down Wednesday - started by two Bermudians, passionate about creating a community where people can relax and a mingle with good wine and good company. Wine Down offers bottomless wine for a $30 entry. The featured wines change weekly to keep you on your toes and coming back for seconds (or thirds?). You can keep up with their events and updates here. Bonus: If you’re here in the Summer, pack your pink & whites and check out @uncorkedbda for National Rose Day (the Bermuda-version of Pinknic)! Harry’s - for daily happy hour deals on wine, draught beer and spirits by the glass. Bulli Social - a fun restaurant/bar with great burgers and a lively nightlife scene. Docksider - a local spot that hosts karaoke on Wednesday nights at 9pm. Dog House - another local spot and one of the few places that stays open much past 11/12pm, so if you’re out past then, this is probably where you’ll end up. Two Rock - not a bar, but a wholesaler, importer and distributor of fine wine. You can visit their shop and learn about any particular wine or find a new one to love. Two Rock is unique in that most of the wines they sell are from small businesses and the most passionate winemakers around the world. In their shop they also have assorted high quality dry goods, including olive oils, sauces and seasonings. Om Juicery - is a hole in the wall retail shop just a short walk from Hamilton’s city center. Founded by certified health and life coach, Preston who was trained at the Institute of Integrative Nutrition and has been in the health scene for over 15 years. The shop offers bottled juices that are made fresh daily, smoothies made-to-order and a newly added lunch menu available Thursday and Friday. 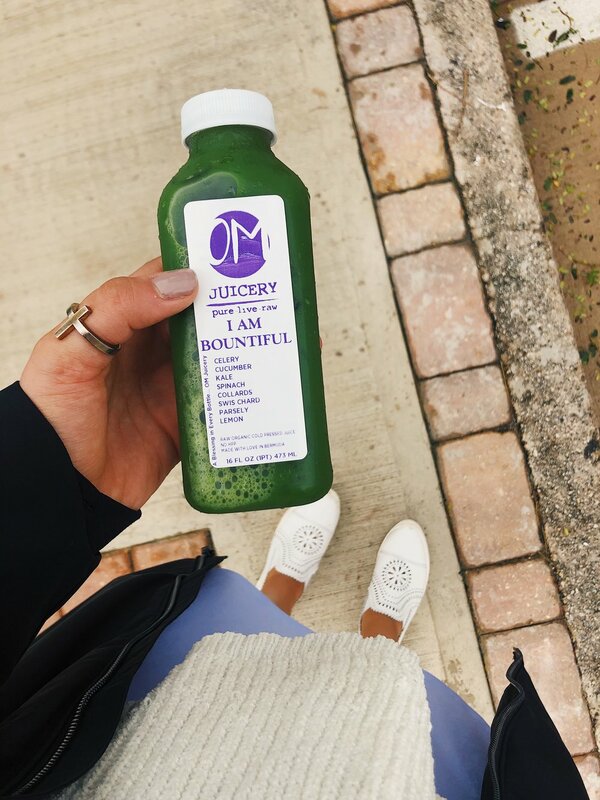 Om Juicery stands out as one of the few juicery/health food establishments in Hamilton, and the only on the island that makes their own cold-pressed juices. Miles Market - an international blend of Whole Foods and Citarella. They specialize in bringing the best of the world, to Bermuda. If you’re missing your favorite food brands or can’t find a food you’re looking for in another grocery store, Miles probably has it! (think gluten-free options, nut butters, milk alternatives, kombucha, etc in addition to everything else you’d want in a grocery store!) Their selection of fine foods, organic produce, new products and pantry staples makes them a trusted feature of the food scene in Bermuda. They also have an impressive wine room and selection! Atelerie - a highly curated boutique that sells designer clothing, jewelry and goods from local artisans, as well as skin, beauty care, and wellness supplements. Fair warning: you’ll want to buy everything. The perfect place to pick up thoughtful gifts for your friends and, of course, yourself. In addition to amazing clothing, some favorite health and beauty brands you’ll find: Four Sigmatic, Herbivore Botanicals, collagen peptides, Stumptown and Canyon coffee, jade rollers, Hu chocolate, Tata Harper, Golde, Vintner's Daughter, Happy Spritz and more! Follow @atelerie_theshop on instagram to see their newest additions and events. Down to Earth - a very simple natural health food store with a juice/smoothie bar. Located right next door to Rock Island coffee if you’re looking for a coffee + smoothie combo or want to pick up any specific brands. Beyond Fitness - Voted Bermuda’s Best Health & Fitness Club of 2018, Beyond Fitness offers group fitness classes like HIIT, circuit, spin, pilates, and personal training. If you’re looking for the high-quality workout you’re used to in NYC, with a more friendly and inviting environment, Beyond Fitness is it. It’s right in Hamilton and you can either get a monthly membership or purchase drop-in classes if you’re visiting for a short time. So far, I’ve taken Tabata with Christine, who is the owner and trainer, and one of the circuit classes, which is one of the most popular classes. Highly recommend both! You can keep up with any local events and highlights on their instagram. Naked Zero - A one-stop-shop for all things ethical, sustainable, non-toxic and zero waste beauty and lifestyle. They feature tons of local brands and as well unique products brands from across the globe. Exhale Spa - Housed inside of the Hamilton Princess, Exhale Spa offers a range of of workout classes, spa and beauty treatments. Highly recommend their massages and facials! (Fair warning, we’re in Bermuda so check the prices before you splurge for a mani, it might be more than you expect!) Follow @exhalebermuda on Instagram for updates on sales and events. Grotto Bay Natural Cave Spa and Wellness Classes - Grotto Bay offers a full menu of spa treatments that are done inside of the natural crystal cave, overlooking a blue lagoon. Classes offered also include crystal yoga and stand up paddleboard yoga. Bermuda’s beaches and weather has you covered if you’re looking to unwind at the beach or pool all day. But if you’re looking for more activities, you won’t be disappointed. Swimming - your biggest problem might be choosing which beach to go! Elbow Beach and Warwick Long Bay are two of the most popular, depending on how far you want to swim! Snorkeling - it doesn’t take much skill, and even if you don’t see many fish, it’s worth getting a better look at that translucent blue water! Some of the best places to snorkel are Horseshoe Bay, Warwick Long Bay, Elbow Beach and Tobacco Bay. Scuba Diving - Check out tour times and availability. Boats go to different dive sites around the island with instructors and guides. Glass-bottom boats - These offer tours around the island. You can even rent glass-bottomed kayaks from some resorts. Kayaks/Paddleboards - you can rent these at almost any hotel or beach for the hour or for the day. Running - Bermuda has an active population and you’ll often see people running along the sides of the road and beaches. Warwick long bay is one of the longest beaches to run on and it connects to Horseshoe Bay where you can choose between staying on the beach or connecting to horse trails. The railway trail stretches across Bermuda, you can jog or run along it, it’s beautiful and wooded. For views: run along the south shore and past Church Bay. Gyms/Fitness Classes - For a small island, there’s a decent amount of trendy fitness classes. In Hamilton, places like Beyond Fitness BDA has drop-in HIIT, circuit and spin classes that are most similar to classes you’ll find in NYC. Exhale Bermuda offers pilates and yoga classes as well as gym access. There are yoga studios like Lucky Elephant, Lotus Yoga. Grotto Bay Resort even has crystal yoga classes and SUP yoga you can try! Horseback Riding - There are quite a few options for horseback riding around Bermuda, see more here. It’s no secret that Bermuda is one of the most expensive countries in the world. While some things may be on-par with NYC, the fact that a protein bar is $5 in the drugstore is not lost on me. This list includes great places to include during your trip but they don’t need to be what makes up your entire stay. Here are some tips to have a more budget-friendly stay. Bring some snacks with you! Grocery store prices seem to be ~2-3x American prices so even veggies, fruits and dried goods can add up. If you can bring some of your favorite snacks you’ll avoid getting hangry and save those extra bucks for a meal at a place you want to try! Pick the things you really want to do and fill in the rest of your time with more budget-friendly activities. The Aquarium, walking around St. George’s, beach hopping, chasing sunset, morning walks or runs are great ways to see and experience Bermuda without the high price tag. Travel off-season. While many of the beach shops might close down in the winter months, Bermuda is just as beautiful. You’ll save on flights, hotels and have a more private visit to the island than during peak season. There’s so much more to Bermuda than this guide could fit but I hope it inspires you to add Bermuda to your travel list! Have you been and have something to add? Comment below or share on instagram @thewellful. Happy Travels!